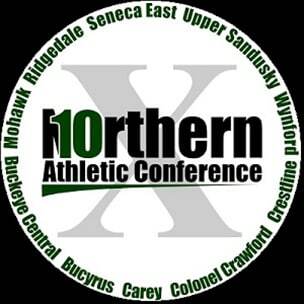 Six baseball players from the Northern 10 Athletic Conference were named to the Ohio High School Baseball Coaches Association Div. IV All-Ohio team. Crestline’s Nate Coffman and Austin Norwood, Buckeye Central’s Austin Lutz, Seneca East’s Ryan Bowerman and Drewe Tipple, and Mohawk’s Austin Harper were all honored. Seneca East coach Frank Lamoreaux was voted state coach of the year in Div. IV. Coffman, Norwood, Lutz and Bowerman were each named second-team All-Ohio. Tipple and Harper received honorable mention. Coffman hit .486 with 10 doubles and 37 RBI, and also recorded a 2.10 ERA for the Bulldogs. Norwood batted .444 with two home runs and 25 RBI. Lutz hit .386 with two home runs and drove in 22 runs. Bowerman finished with an 8-1 record and a 1.46 ERA. Tipple hit .403 and drove in 27 runs. On the mound, he finished with a 6-0 record and 1.53 ERA. Harper batted .404 with eight doubles and 20 RBI. As a pitcher, he finished 8-1 with a 2.17 ERA and 56 strikeouts. Lamoreaux directed Seneca East to the N10 championship, compiling a 16-2 record in league play. The Tigers, 22-4 overall, lost to New Riegel in the district championship game on May 23 at Shelby High School. Cam Alldred from Cin. Country Day and Clyde Yoder of Berlin Hiland were voted co-players of the year in Div. IV.